2012-04-25. PocketFullRecall PPC_1.3.41 has been released (changelog). PocketFullRecall.cab (115KB; copy the file to your PocketPC device and then run it to install it). Upgrading to a more recent version is possible by the same procedure as installing new version from scratch (i.e., just download PocketFullRecall.cab and run it on the device). If you use Today plugin, you should disable it before the upgrade (by navigating to Start->Settings->Personal->Today->Items and unchecking "FullRecall"), otherwise today plugin cannot be upgraded. This version is currently not limited in any way for unregistered users and there are no plans to limit already available features (or database size) to registered users: PocketFullRecall will remain totally freeware (most likely), or there will be introduced some extra (non-essential) features that will be available to registered users. Database files (fullrecalldb/*) are fully compatible with PC version, you can copy them back and forth, but don't do it while any FullRecall version is turned on. The PocketPC version doesn't save or read elements.xml file though (because of performance reasons). For syncing the files you can use Microsoft ActiveSync; if you use a SD card, you could get away with no syncing at all and just work with the SD card (that contains FullRecall database) on PC and PPC device. Old devices: devices based on Windows Mobile 2002 and older. Windows Mobile 6.0 and 6.1 (Classic and Professional). Simple .wav files are supported, just make sure the sound files were saved in the database directory (if database was created in the PC version), so paths to the sound files were stored as relative (see this entry in FAQ for more info). External application (pimg.exe, built-in in Windows Mobile) is used to display images. If question (or answer) of an item contains an image, it will display extra " <img>" (the extra string is hidden in the edit mode): double-clicking such question (or answer) will pop-up the external application with the image. pimg.exe seems to only support JPEG files (at least version from Windows Mobile 2003, version from Windows Mobile 6 is reported to support BMP and GIF too). Support for adding and altering already set sounds/images. Configurable use of hardware buttons. 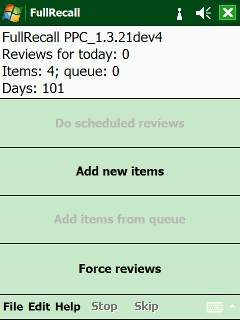 "Today plugin" displays number of items that are due to review today. The plugin is not enabled by default, you can enable it in Start->Settings->Today. How do I delete item? Tap-and-hold over question (or answer) field, and pick "Delete This Item" from the context menu. How do I learn from some categories only? Tap-and-hold over the button that starts the chosen learning mode ("Go through scheduled reviews", "Add new items" or "Force reviews"), so that dialog with categories will be shown. I see square boxes instead of some characters. You need to install a font that covers the characters (see also I don't see properly some characters question in the FAQ about PC version, it lists some fonts you can use on the mobile device). Installing a font on the mobile device is as easy as drag-and-dropping a font file into \Windows\fonts\ directory, then starting PocketFullRecall and choosing the new font in Font settings.